Organize your flatware with this white polyethylene cylinder! Sturdy enough to stand on its own, this cylinder is perfect for organizing flatware at restaurants and catered events. Knives, spoons, and forks will all fit into this cylinder without slipping through the holes, so you don't have to worry about losing any flatware. Conveniently place this cylinder at the beginning of a buffet line or display it on a table for guests to select their own disposable or reusable utensils. These are great! Helps keep our utensils in order and in one spot! Cost was low, and they are durable! I would recommend them to anyone that was looking for something to hold utensils in! this Plastic Flatware Cylinder is absolutely a great purchase and is very durable for its price. time will tell how long they will last with daily use. for the price you cant get much better. Very handy for utensils when dishwashing. Water drains easily and utensils dry quickly and just pour them into the utensil drawer to arrange. Tried other ways previously, now find this cylinder is perfect for the task. Cannot beat the price for quality with these plastic flatware cylinders. They are durable and work exactly as advertised. i am extremely satisfied with this purchase and will get more as needed. These fit perfectly in the stainless steel flatware holder we purchased from webstaurant. They are very inexpensive compared to other products or from other companies. These silverware drying cups work great. They stack together when not in use, don't rust and were a good price for the durability of the product. Would recommend them and will be buying more in the future. We use these to hold scoops for our gourmet popcorn, and they work fantastically! Sturdy, easy to clean, and they last forever. Definitely would recommend. These flatware cylinders are pretty tough especially considering their price. I have used several in the dishwasher and they work really well. I also use them to hold plastic utensils on the counter. Time will tell how long they hold up with constant use in the dishwasher, but at this price they are easily replaced. The simplest of items, yet an amazing value. As we only use our flatware occasionally, storage was vital. This product fulfilled that need at a mere few dollars cost. How do you offer these so cheap? Not much to say about it as its pretty self explanatory but this flatware holder does its job. I would recommend it to anyone looking for one. Ordered this product to store plastic tasting spoons. During transport the item cracked on the bottom. Not a big deal, just very cheap and fragile. I would recommend buying the stainless steel vessels. Thank you for your feedback! Please contact us as soon as you notice issues with your order, so that we can help you in the best way possible. These Plastic Flatware Cylinders are perfect for storing and transporting flatware. The cylinders have ventilation holes to allow for additional drying of utensils and small single serve ladles. These cylinders work great and we have a few of them to use for various silverware. We've been using them for a long time and they always do the job! Gets the job done at a great price. We have broken a few but at this price we weren't too worried about breaking a few. This durable flatware cylinder can be used at home or in a commercial kitchen . The container easily holds flatware without tipping over and the design allows flatware to air dry . These are decent. If you have something a little too long, do not bother putting it in here, it will tip over. But, if you are using it to sit inside something, you don’t need to worry about that. I only wish there werent as many holes, that way forks would not be an issue. This plastic flatware cylinder is great for a small amount of flatware that may need to be washed. These cylinders also work great for storage, while silverware isn't being used we will store it in here. These plastic utensil holders fit perfectly in both a dish rack and a cafeteria style holding bin. They are durable and clean looking. We’ve never had an issue and they get the job done. Highly recommended. Love using this cylinder when I'm hand washing dishes. I put all my clean silverware into this cylinder to dry, and the holes on the bottom of it allow excess water to drain right out. This is a high-quality plastic flatware holder. We use it on our bus cart to separate dirty flatware from dirty dishes prior to dishwashing. It's easy to clean along with the flatware. 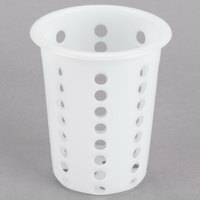 A very good perforated plastic cylinder, this hold flatware and can be easily used for draining excess rinse water. It is deep enough and has a holding lip. I absolutely love this flatware cylinder. The holes on the sides will promote airflow through the silverware and not allow any mold to grow. Great product at a great price! These flatware cylinders are cheap but help so much with keeping the flatware organized during washing and drying. Fits in the rack compartment easily. Great buy! This plastic white flatware cylinder is pretty strong plastic. It has holes all throughout even underneath for easy draining. This cylinder and sit up alone on counter or sit in a cylinder holder. Organizing flatware while doing dishes makes sorting flatware after dishes are done much easier. These plastic flatware cylinders will hold all types of forks, spoons, and other miscellaneous items you may own. The plastic flatware holder features holes to allow air to pass through speeding up the drying time. These are good to have when doing cleaning silverware, but if you don't have a holder for them the tip over easily. But they work well to sort and separate flatware for drying. Great silverware holder! Inexpensive way to keep silverware organized, sanitary, and dry. We currently use them freestanding, but looking at a cylinder holder in the future. We were own to only 7 for our Senior Center congregate lunch. Hard to keep filled with clean when need to use when sanitizing dirty silverware. I own a bakery and have a few colors in this silverware container. We use it for our plastic forks for craft shows and vendor shows we do. Works great! We use this white plastic flatware cylinder as a caddy for flatware and knives and other utensils to wash in the dishwasher. We use it everyday and so far so good. It holds the utensils really well. And the price is amazing. I purchased the Plastic Flatware Cylinder for home use. The quality is really good and so is the price! I am using it for silverware that has been hand dried but not completely dry. Great item! Great for use with cady and storage. We have extra ones for change out and you can also use them in the dishwasher for small items that you don't want blown out of the dish rack. This container can be used for pretty much anything and everything! We use it for stowing utensils and straws. It's got holes for draining water. Great price. This is a pretty standard flatware cylinder and matches other ones that we previously had. These are sturdy and durable. Unless we lose them, they will hold up for a long time. This is probably more suited for restaurants, but I like keeping one of these in my kitchen for all of my mismatched flatware. Super easy to clean. The container is a good size and has the holes in it to help with draining. i would recommend rinsing off the silverware before putting it in it and cleaning as not all the time does the water get completely in. We use this to keep utilses and spatulas and wooden spoons together all in one place. Strains out any water after washing and keeps our things organized. Great Plastic Flatware Cylinder for a very economical price! These are perfect for air-drying utensils and flatware after washing. Super lightweight and durable, easily washable. Since they are lightweight, just make sure when filling with utensils to try, to disperse them evenly, or else will tip over. I got these plastic flatware cylinder to hold and dry the spoons. They are perfect and sturdy. they are easy to clean too. Great deal for a great product. We bought these to put by our sink to air dry our flatware. They are a convenient size and the holes in them make it easy for air to get through to our flatware. These are used to both wash our silverware and to store it in next to the milkshake machine and soup kettles. I recommend buying these in bulk. Perfect from washing/rinsing right to the flat wear cylinder holder purchased from Webstaurant. Looks professional and can stand on its own pretty well. I like the drain holes for easy cleaning. We use these flatware cylinders to hold both our flatware and also our cooking utensils in order to keep them easily accessible. The cylinder is made of a durable and thick plastic and looks good as well. Having a larger than normal family, I needed an easy flatware container for our dishwasher. These cylinder baskets work well and hold a lot of flatware and they stand up to a lot of use. We actually use this on our drying rack to hold flatware until it dries. Works great for this purpose. We will be buying more of these when the need arises. These are always great to have around to store extra flatware, steak knives, etc. We keep a holder with 4 of these containing spoons on our soup buffet. These were perfect for standard sized silverware. It allowed them to dry without being contaminated again with a cloth or hands. , it fit nicely with the holder. This does exactly what is says. Good product for the money. The product is durable and easy to wash. It holds a good amount of flatware. This is exactly what you think it is. Works great for drying silverware. Only issue is it can get a little top heavy if you've got longer utensils in there. We have a few of these units. They are easy to clean. There are stainless options, but we thought these would do the trick. So far so good. The plastic flatware baskets of our home dishwasher kept breaking from sharp knives being placed into them. Did not know what to do. Then I ordered one of these to try, and loved it so much that we ordered more! They are way more durable (and economical) than the flatware baskets that came with our dishwasher. They are made for commercial use, but can easily be used at home, too. These rock! Needed a container to keep clean silverware organized and dry. We use these in front of the house with a holder to keep it simple. There are a number of uses we can think of for this Plastic Flatware Cylinder. Organizing pens, small utensils, and of course, flatware. Nice quality and a great deal. This flatware cylinder makes washing silverware so much easier. Plus it is good for drying, helping keep water spot down to a minimum. These are also affordable and will get ordered again when we need new ones. These are your classic silverware cylinders used to sort, wash, and store silverware. They are very affordable and do not wear. I prefer them over the stainless ones. These do the job but they do discolor over time. Mine ended up getting some yellow tint on the bottom of them but for the price you can't beat it. We have three of these that we use for our clean silverware. The quality is good and they are the perfect size to hold several pieces. Durable plastic, very thick, there are holes at the bottom of the cylinder as well, easy to clean and remove from holder, straws may go thur but not utensils. These "cones" have many uses in the restaurant industry. They are extremely durable which makes them a must-have for any restaurant going through a large volume of flatware. We purchased them for our church festival, to facilitate a quick replenishment of plasticware during busy meal times. We purchased couple of the plastic flatware cylinder and they have been a good investment. We use one to organize silverwares, and one for the hot dog tongue. Great for the price. These flatware cylinders (which we always called stericils for some reason) are much more durable than the ones they replaced. We have used them for over a year and no knives have cut through the bottoms yet which is what usually happens. I'm happy and think they were worth the money. Can you really go wrong with something like this? Good quality, dishwasher safe, holds a ton of spoons or forks. These are great for keeping silverware organized, and are heavy enough to still stand when most of the silverware are taken out. Overall, very good product. I bought several of these to keep my flatware organized. They are very well made of hard plastic, not flimsy. They are dishwasher safe. Large enough to hold alot of flatware. These work very well to hold plastic spoons, forks, knives and even straws. We have purchased extra ones so we could keep a few filled with more spoons so when we're busy and run out of spoons, we just grab another container-full. These are sturdy and hard plastic. They easily fit into the stainless steal holder. They are dishwasher safe and help to keep the utensils organized in the dishwasher. These fit in a bigger unit that we purchased. we loved the unit and these cylinders were great. Get a few extra as backups for a speedy refill of yor unit. Nice flatware holders. They have stood up so far, and are much cheaper than stainless ones. They get the job done and my dishwashers like them. Great sturdy plastic flatware cylinders. They fit perfectly in our stainless steal holder. You can easily fit lots of cutlery. Best price in town !!! These quality plastic flatware cylinders drain great. They work great to presort the flatware in our restaurant which saves tons of time when restocking the line. Pretty decent and cheap silverware holder. I like having the plastic because they are easy to throw right in the dishwasher and then let the silverwear dry out in them after. After prolonged use they start to get worn out. But for this price you can't complain! I love the economy of having several of these around to keep my silverware close by. With my silverware in these cylinders inside a holder, they can move easily with me wherever I need them. And they can hold the wet ones for easy drying. i like these plastic flatware cylinder because water does not stay inside. sometimes if your not careful enough, it gets moldy when you don't clean it. this is just what i need. These plastic flatware holders are good for washing flatware! Place dirty flatware in them and wash in dishwasher!! The material makes for easy removal straight from dishwasher, unlike the metal ones that are too hot directly from the dishwasher! These are so useful. They hold up through multiple washings, they are sturdy and don't easily fall over and they are cheap on this website. I've used these flatware cylinders for many things. Their unique design allow for drainage so flatware dries nicely. Sturdy stainless steel and very durable for restaurant use.